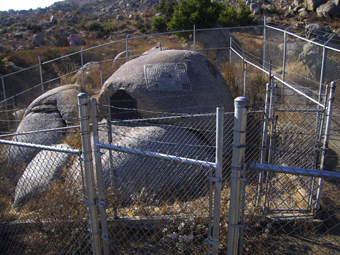 A big, striking petroglyph of unknown origin graces a small mountain area called Maze Stone County Park in Hemet, Riverside County. 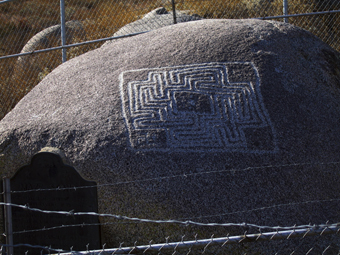 Inscribed on a large boulder, the three-foot-square figure is a maze formed by four interlocking swastikas. The design is almost unknown among Indian petroglyphs, and archeologists attribute it to the so-called “Maze Culture,” who left only one similar design, miles to the south in San Diego County. Maze Stone has also been explained as everything from a 15,000-year-old remnant of the “Cascadians,” the alleged ancestors of the Maya, to a religious symbol left by Chinese Buddhist monks at about 500 A.D. The latter theory is popular among historians seeking to prove that the Chinese beat Columbus to North American by at least 1,000 years. From State Hwy 74, go north 3.2 mi on California Ave to Maze Stone Park.